Happy New Year folks! Can you believe that it's already 2011??? Wow 2010 sure did fly by fast! ....BUT with the start of the new year comes... you got it...the start of new resolutions. Like every year past, my biggest problem has always been weight gain over the Christmas break, also known as the "Holiday 15". Something about getting together with the family + yummy Southern large portioned meals + suburban life in Texas (i.e. watching movies and driving everywhere) always leaves me happy but much heavier upon my return to the North. 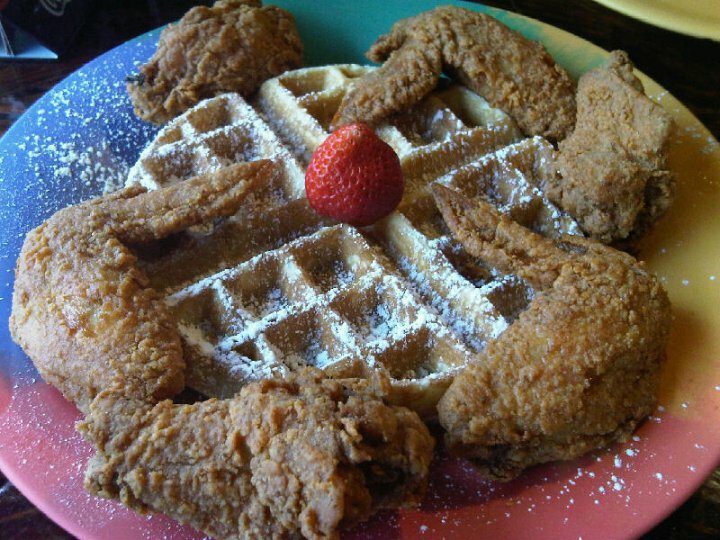 Chikin' & Waffles -- a Southern tradition! THE FINANCE FOODIE SHAPE UP SERIES! Too many chikin' & waffles! Today, I will share my exercise plan. At my peak fitness, I followed this plan below, prepared for me by a trainer at my gym. Please note that I am NOT athletic (been an asthmatic kid my whole life) and really despise running, therefore this plan below might be a bit "novice" for you marathon rockstars out there (do feel free to adjust to meet your own fitness level!). Stay tuned for the next part of this SHAPE UP SERIES, where I will share my favorite diet friendly snacks that don't taste healthy and are super filling! Congrats #2 - Erica C! Yoplait Light sent me a workout kit consisting of a gym bag, a reflective wrist wallet, a free cup of Yoplait Light for post-workout and a pedometer to keep me moving and motivated for this SHAPE UP SERIES, and they want to give one of my readers the same gift! 1. REQUIRED In my comments section, tell me your favorite Yoplait Light flavor or a flavor you want to try (mine is Red Velvet Cake -- cause I can have my cake, and eat it too without all the fattiness of a real red velvet!). Also, leave an email address so I can contact you if you win! This is a quickie! Contest ends Friday, January 7, 2011 at 5pm EST. Winners will be chosen via random integer generator on random.org announced on the financefoodie.com site shortly afterwards that night! 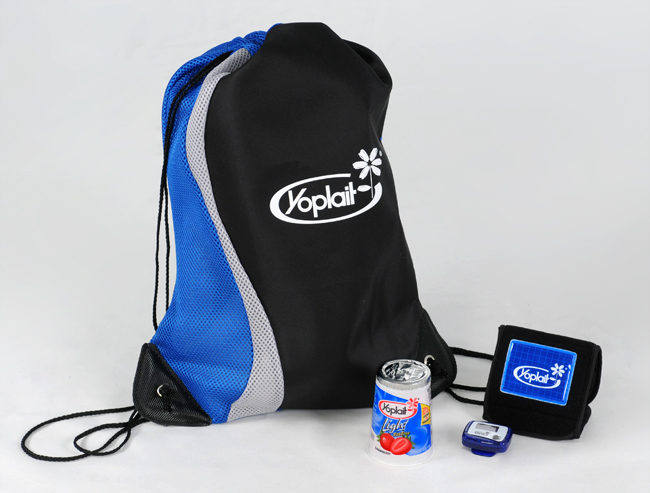 Disclosure: Yoplait Light provided me with the prize pack for giveaway. Wow I didn't know there was red velvet...I'd like to try that. I like the strawberry banana. Keep strong working out! the apple turnover looks yummy. I want to try the Blueberry Patch flavor. Thanks. I would love to try orange creme. I think it would taste a lot like a dreamsicle but healthier. My favorite is the Lemon Cream Pie. My favorite yoplait flavor is vanilla, when it comes to yogurt I am a plain jane. White Chocolate Strawberry is THE flavour for me! Strawberry yoplait light is so good :) good luck with your weight loss, I'm trying to lose some weight too! And now for a regular comment! I love strawberry; I stick with the basics! I'd like to try the White Chocolate Strawberry version! I want to try the raspberry cheesecake. I'd love to try the Boston Cream Pie flavor! Raspberry cheesecake is my favorite flavor!! Strawberry Orange Sunrise would be my flavor of choice! My favoriteflavor would be the Pineapple Upside Down Cake. My favorite flavor is the Key Lime Pie. I'd try the key lime pie. The key lime is good! Key Lime Pie is my favorite. Pineapple Upside Down Cake is my favorite! There isn't a flavor I haven't tried and liked. My favorites are red velvet cake and the berry torte. I would love to try the pineapple upside down cake! Yum Yum! My favorite is Raspberry Cheesecake! I'd love to try the Lemon Cream Pie.